Things got spooky scary at this year’s Halloween office party! Traditionally marked by a bonfire — a tradition that unfortunately had to be distinguished due to strict adherence to New York City’s thorough and sensible Fire Safety Regulations — Halloween is a celebration that denotes the end of the harvest and the necessity of the cold months that follow. 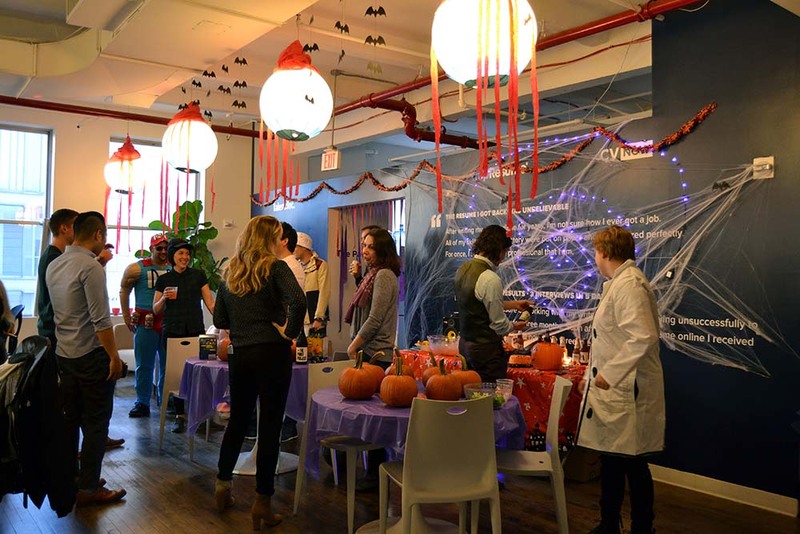 To ring in the “darker half” of the year, the team here at TopResume’s parent company, Talent Inc., gathered to share a little food, some drink, and some “spooky” fun. Under the unblinking gaze of disembodied eyeballs, and surrounded by the specter of pumpkin carving, employees took leave of their usual tasks to change into their costumes, and to toast what has already been a year of bounty and growth. Costumed and un-costumed alike played video games on the office projector, while others sipped the welterweight punch (gin fortified with Aperol and rosemary), admired Duffman’s Adonis physique, or conversed while Warren Zevon softly howled about the werewolves of London in the background, as he often does this time of year or when the moon is just so. 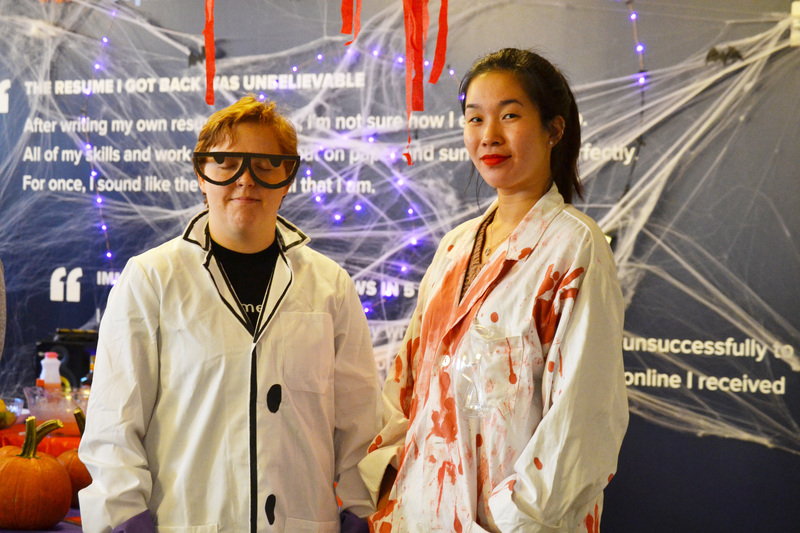 Transformed from their usual roles as editors, marketeers, tech-geniuses, and client-minded champions, our spirited competitors took on such forms as Wednesday Addams, Mugatu, Harry Potter, a subtle-yet-unmistakable 90s Recess kid, a plush-onesie unicorn, and a sinister scientist. Myrrah and Tracy in their "spooky costumes." The trophy awarded to First Place will rest on Mike’s desk throughout the year, and be passed on to next year’s Best Dressed. An enamel pin and spooky gummies were awarded to the runner-ups. 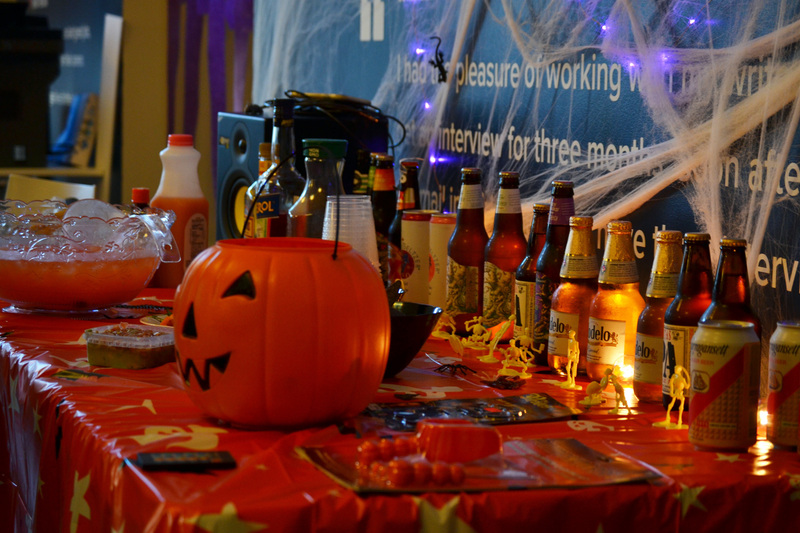 Though no pumpkins were carved, much fun was had hobnobbing around the office. Hope remains that the hardy gourds will make their way into hearty soups by December, or perhaps to the potluck table for Thanksgiving.